Mercedes Benz F1 Experience - We Are Fearless | Boldness with backup. 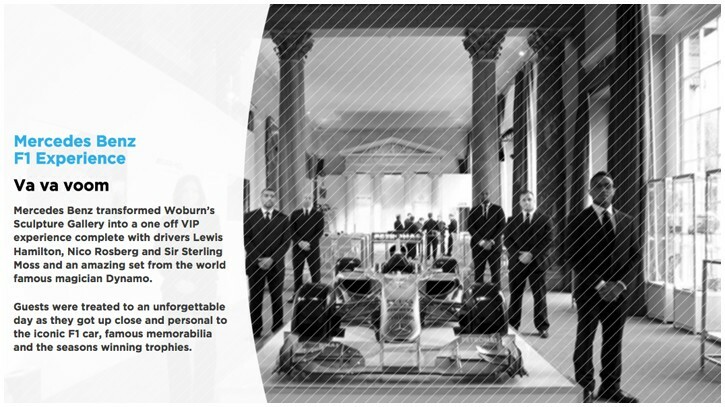 Mercedes Benz transformed Woburn’s Sculpture Gallery into a one off VIP experience complete with drivers Lewis Hamilton, Nico Rosberg and Sir Sterling Moss and an amazing set from the world famous magician Dynamo. Guests were treated to an unforgettable day as they got up close and personal to the iconic F1 car, famous memorabilia and the seasons winning trophies.